Rory McIlroy acklowledges the crowd in San AntonioNot even a tangle with a cactus could stop Rory McIlroy banishing all talk of heading to Augusta in the throes of a “slump” when he matched the low round of the day and birdied his last three holes to get withing three shots halfway leader Billy Horschel - his old Walker Cup “enemy” - at the Valero Texas Open. On a day when Padraig Harrington had to come home in three under just to shoot a 73, the world No 2 had seven birdies in a five under 67 to finish his day a shot off the lead before Horschel picked up a couple of late birdies to move three clear of the field on eight under. Encouraged by his caddie to get more competitive rounds under his belt, McIlroy only added the event to his schedule a week ago and it is looking like an inspired decision. He cannot regain his world No 1 spot from Tiger Woods with a win but he can motor up Magnolia Lane next week with his confidence on the rise. Accustomed now to being questioned criticised when he drops his standards even a notch, he’s won two majors by the astonishing margin of eight strokes and each time he’s gone into those majors with question marks over his form. As he told a selection of UK-based reporters in San Antonio this week: “The last couple of times, I mean the only two times, I have won a major, it has come that way. “I have come off a little bit of criticism and people questioning whatever it has been; from the Masters [in 2011] going into the US Open, does he have the attitude, the mental toughness to finish it off. “I had just come through a bit of a rough patch last year heading into the US PGA, through the summer, and got that sorted pretty quickly. Maybe it is a good sign, maybe it is a good omen. I just wouldn’t like to go into every major struggling, that wouldn’t be a good thing. McIlroy knows that most of the focus at Augusta will still be on Woods as he attempts to win his 15th major and his first since the 2008 US Open. But if he can build on Friday’s second round, which featured bogeys at the sixth and ninth (where he caught his shin on a cactus in the rough) he will tee it up at the Masters confident he can turn his talents into four solid scores there for once. “Last year I took a six twice on the first,” he is quoted as saying in by The Guardian’s Ewan Murray. “You have just got to be on top of your game because if you are off at all, you’re going to throw in a 40 for nine holes, as I always seem to. He admits that he is still in awe of the course, though not as much as he was in 2009 and 2010. Shane Lowry had three birdies and three bogeys in a 72 to fall 12 places to 29th on two under par, which is just a shot behind the maddeningly inconsistent Harrington. Having displayed all his old short game magic and mental strength in an opening 68, the Dubliner was off the boil for nine holes on Friday as he stumbled to the turn in three over 39. Bogeys at the 11th (bunkered off the tee), 13th (missed four footer after a decent recovery chip) and 17th (four to get down from 54 yards after a poor pitch and a three-putt from nearly 80 feet) saw him disappear from the leaderboard. But he undid at least some of the damage on the way home. Having failed to birdie the 342 yard fifth after driving to within a few feet of the green - he misread an 80 foot eagle putt, knocked it off the green and then made an uncommitted strokes on the 15 footer from the fringe - he finished with a couple of birdies. 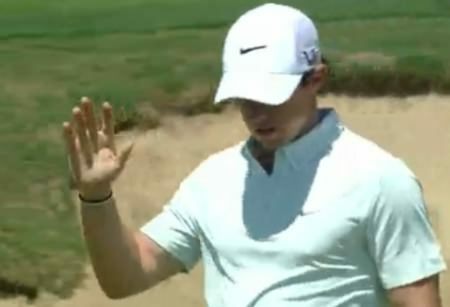 Having knocked in a 10 footer for birdie at the sixth, he had to hole another one to avoid a three-putt bogey from 76 feet at the seventh and followed a missed nine foot birdie chance at the eighth with a closing 18 footer. Rory McIlroy’s Masters chances suffered a major setback when he missed his first cut for 11 months in the Shell Houston Open at Redstone. 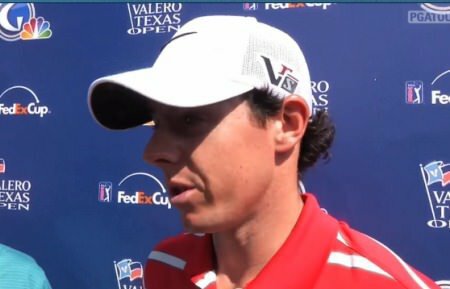 Rory McIlroy made some mistakes but still has a chance going into the final round in San Antonio.Rory McIlroy hopes to put himself in the mix in the final round of the Valero Texas Open and head to the Masters with his confidence on the rise.